What is true dedication? Blogging from a Super 8 Motel in Gardiner, Montana. For you, I do this (as I wait for over 1,000 photos of Yellowstone bison, elk, pronghorn, mule deer, bighorn sheep, and geysers to upload). 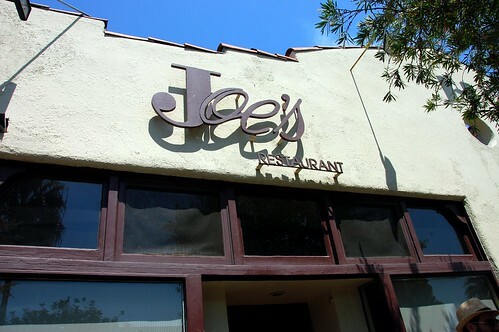 Joe's Restaurant on Abbot Kinney in Venice is about as different from Gardiner, Montana as can be. It's sunny and happy, and its offerings are fresh and delicious. We were glad we'd made reservations. 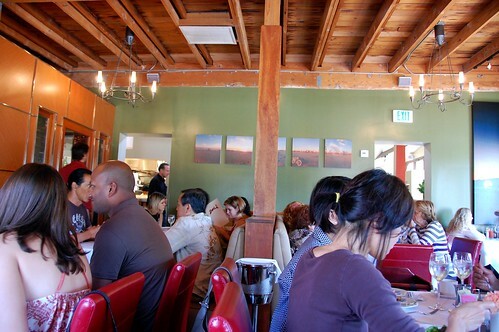 Joe's gets pretty crowded for Sunday brunch. The complimentary bread is crazy good -- sweet zucchini and buttery brioche. 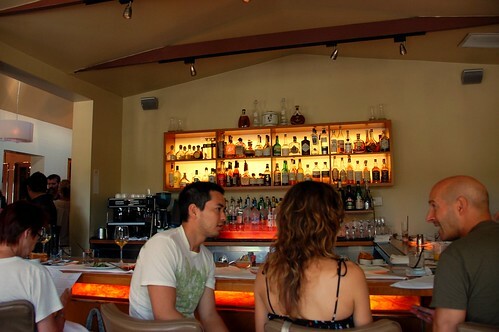 Each brunch entree comes with your choice of an appetizer. Mr. Monkey got the soup of the day, which was a scrumptious cream of carrot. 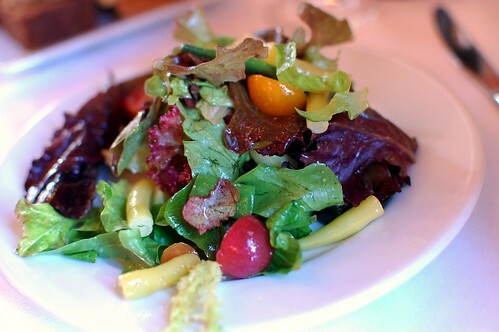 I opted for the three-bean salad with tarragon gelée, market cherry tomatoes, and white balsamic vinaigrette. There is no such green deliciousness in Gardiner, Montana. But I guess there are no bison in Venice, California. This salad was tastier than almost everything we've had in Gardiner, Montana. Hmm. Point to Joe's. Sorry, bison. 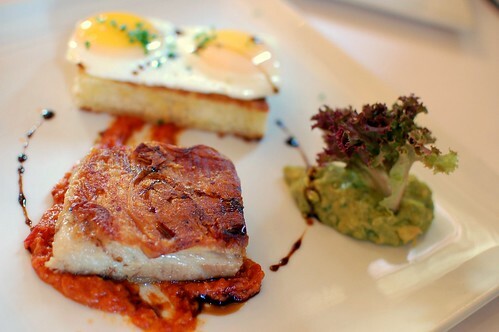 Mr. Monkey's crisp pork belly confit with tomato-bacon jam, toasted brioche, and sunny side-up eggs ($15) was kind of incredible. Rich, meaty, and luscious with a touch of sweetness. Oh, man. So nom-nom-errific. It's times like these when I really appreciate that we always switch meals halfway. 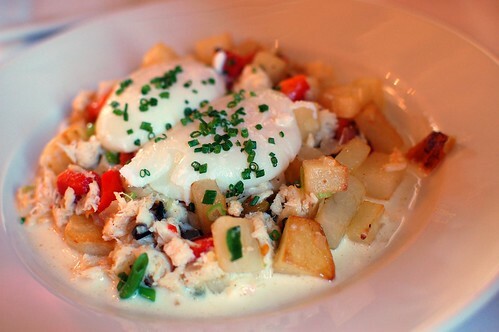 My Louisiana blue crab hash with poached eggs, red and yellow peppers, potatoes, and mustard-rosemary sauce ($16) also impressed, but it was still clearly the silver medalist. Not too shabby. It's just not crisp pork belly confit. I wish I could eat at Joe's. There is no Joe's in Gardiner, Montana. Thank goodness we are only here for one night. At least there is free Wi-Fi. And a TV. There was neither Wi-Fi nor TV in our Yellowstone cabin. That was roughing it for me. Cross your fingers that we spot moose tomorrow. I have given up on bears and wolves. Is a moose too much to ask for? I want to see a moose, damn it. Um you're ROUGHING IT. Like a real camper. Salads are for city folk ;-) Glad you're having a good time. 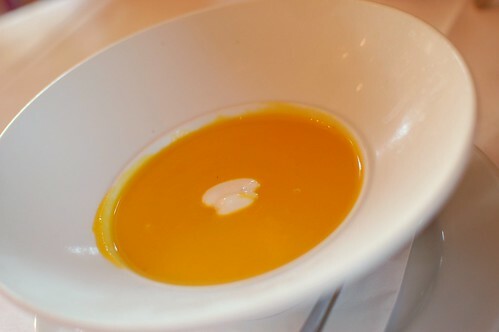 that carrot soup looks delicious! can't wait to see more pics! I really hope you get to see your moose! Joe's looks good. I am really looking forward to the Montana posts. yay for moose! i hope. Moose would be nice. Bears, however, oh no. I would poop twice and die. I love Joe's. Please buy me a Russell Chatham print while you're up there. kthxbye. 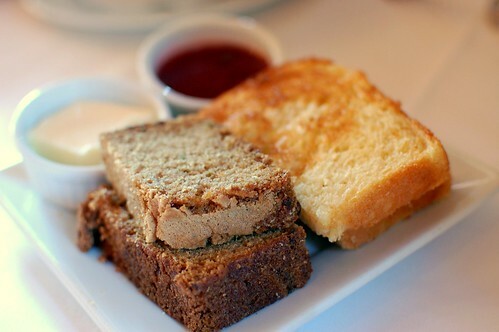 You had me at zucchini bread. Super 8? Do you own a haz mat suit? my head is still spinning at "super 8." The way you felt about moose was how I felt about Eskimos in Alaska. Eggggggs!!!! That's near my hood. I want them eggs.